Rihanna's appearance on this year is likely to be on low tone but we can still stretch out bows on her since she is collaborating with Donals Glover film called Guava Island. The film was directed by Hira Muria and it was shot last year been 2017. 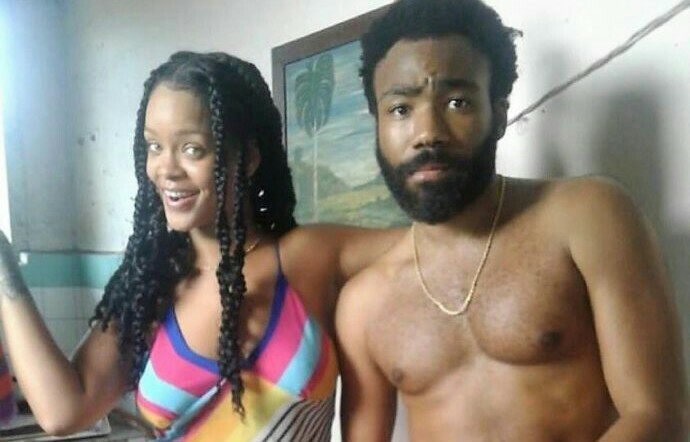 Rihanna never talked about Guava Island but we all knew it that RIRI is clearly having some line with Donald. However, things stick around and all hears where cleaned up after the news surfaced that the film will embark it's first play probably during Coachella festival. Well is no longer something we need to expect after on Thursday it was played on the festival grounds for select audience. The one hour long film stars Glover as a musician named Deni who wants to put on a music festival to try to unite the people of his island. On same film you will also see Our RIRI star herself his girlfriend, Kofi, with Letitia Wright (Black Panther) and Nonso Anozie (Game of Thrones) in supporting roles. The film will also feature remixes of some of Glover’s songs. Now, Amahiphop Hip-Hop believe that not most of us has watch the Rihanna's New shot with Donald. The movie is currently getting premiere on Amazon Prime being today Saturday, April 13th at 12:01 AM PT, just after Childish Gambino’s set ends on Friday night. It will also be streamed for one time only at 5 PM PT on Saturday via Twitch, and simulcast on Coachella’s YouTube Channel.